Mile 63: At this unmarked turn, you'll be passing through some open white gates onto a golf course access road. There is a sign posted nearby indicating private property but the access road is open. The access road (Fairway Dr) will zigzag past houses on the edge of the golf course. As the road meanders around some bends, you'll want to stay on the main hardtop road and avoid the gravel side lanes. Mile 68: There is a note on the cuesheet about multiple metal grate bridges that you will be encountering. A couple of these are on a downhill dip and a bit longer, and will require some extra caution, especially if wet. 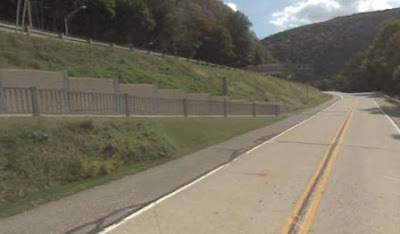 Mile 59 and 182: You'll be passing through Water Gap twice on day 1. The controles listed are the Bakery and Diner. However just like with the 300k and 400k, Water Gap will be an open controle and you may stop at any of the other options along Broad St, which also include two mini-marts and a pizzeria. If you are close to the time limit, these establishments may be closed at night -- if so, you can stop at the Deer Head Inn on Rt 611 near mile point 183. Mile 295 and 322: You'll be passing through Morgantown twice on day 2. There is no controle stop here, but there are several good stores and restaurants for resupplying. There are very limited services beyond Morgantown in both directions, and the the turn-around point (which is recently now under Exxon ownership) does not have rest rooms and only limited food options. Mile 354: Caution added for rough road surface. If you are staying at the hostel on Friday night, earlier arrivals before 9:30PM should use the Woman's dorm. Later arrivals should use the Men's dorm. You can use the same bunk when you return for the overnight controle. I'm planning on being at the hostel by late afternoon and hope to be asleep by early evening in the Family dorm, so I can wake up early and prepare breakfast. Park your car in the large gravel lot on your right, halfway between the road and house -- the few parking spots near the house are reserved. If you have a personal SPOT unit that is not listed above, please send me a link to your personal tracking page. Please note that the older SPOT units need to be reset after 24 hours. The cuesheet has been updated to draft 8 (dated 5/26). This update incorporates many course changes based on a checkout ride this past weekend of the upper 200k Water Gap to Water Gap loop. With it being my first "warm" ride of the year for me this year, I was glad not to have another 100k to go when I got back to Water Gap. And without a doubt, road crews have their work cut out for them this summer to repair many potholes and rotten pavement. Unfortunately, there has been little progress so far in fixing the roads from the rough winter we had. And the poor condition of Rt 97 between Barryville and Hawk's Nest has prompted a major reroute to instead use an alternate route through Eldred. While adding a bit of climbing, this reroute will avoid several miles of rotten pavement along with many large cracks between the road and shoulder that were particularly hazardous. The reroute will also avoid quite a bit traffic in the form of motorcycle packs and vans for all the rafting operations which is typical for Rt 97 this time of year. - There was closed bridge on Snow Hill Rd. The bridge was actually in great shape, and looks like it was replaced some time in the past 10 years. But in addition to mounds of dirt, PA DOT put in a barrier at both ends of the bridge for good measure. It is passable by foot, but a bit inconvenient: you will need to lift your bike over the barrier and then straddle it to get past. But that minor inconvenience is worth having a 5-mile segment with virtually no traffic. - Rt 402 is in bad shape, with big potholes in many locations. Riders will need to stay vigilant to avoid these. The last 2 miles on the downhill on this segment are particularly bad, and need extra caution. With fast traffic on this stretch, it is advisable to stay on the shoulder and slowly pick your way around the rotten pavement. - There was a "Road Closed" sign at the beginning of Kimbles road (the turn off of Rt 6). It is actually passable by both car and bike, but there are several short stretches of road that have deteriorated to gravel patches. With the low traffic through here, it is entirely manageable but extra caution is needed. 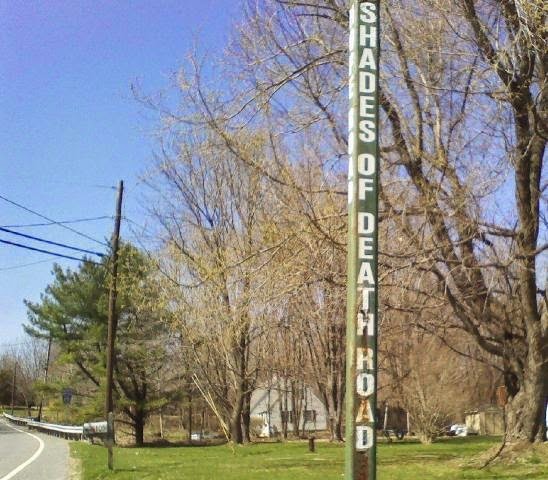 - Towpath Rd along the Lackawaxen is another road in serious need of some love from the DOT. There are some stretches of rotten pavement that are manageable, given the low traffic conditions. The turn-around point in New Holland is an untimed information controle at a MiniMart. So the first closing time that you need to meet is the penultimate controle at mile 348 -- this gives you practically all day to catch up on the time limit if you get a late start after the sleep stop. I am often asked about the availability of GPS files. Even though I have recently purchased a Garmin 800, I confess to being somewhat of a Luddite when it comes to GPS navigation. Given the many different ways that even experienced users can mess up a GPS route, I'll be sticking to cuesheets as the official course description. Also, there are specific safety warnings on the cuesheet that may not carry across to your GPS. That all being said, if you have GPS file that you would like to share with others, you can post a note on the message board with your contact info. There is a volunteer preride scheduled for this Wednesday -- be sure to check for any last minute cuesheet changes on Friday. The website has been updated with draft 7 of the cuesheet, which has the 2014 changes. A map/profile has also been updated. For 2014, day 1 will follow the Delaware River to Water Gap, like the 400k did. From there, we'll head to Hawley, using roads we once used a long time ago in the other direction (Snow Hill Rd). We'll return to Water Gap using the NJ side of the Delaware Water Gap National Recreation Area. Day 2 is mostly unchanged from 2013, with the exception of Blue Ball being the turn-around point. The changes for the 600k **should** make the course kinder and gentler -- unlike the 400k which were decidedly harder. Following the Delaware River to Water Gap is most certainly easier than the 2013 route. The approach to Hawley up the Alleghany front is probably equivalent to the 2013 route. The return through the park on the NJ side is a bit tougher than the 2013 route down the PA side, but should be much quieter and more pleasant in the fading sunlight than dealing with the traffic through Shawnee. A volunteer preride is planned for Wednesday, May 28th. Be sure to check for any cuesheet updates which will be posted on Friday, May 30th. It seems that weather for the 400k each year coincides with the first warm, humid day of the year. Indeed, that was case this year for volunteer preriders, Patrick and Cecilie Gaffney, who took one for the team. As noted in their preride report, those conditions made the hilly legs from Water Gap to Pine Grove quite a bit tougher. But conditions on the day-of-the-event were nearly ideal -- at least for those who prefer cool temperatures. And those riding into the early morning hours on Sunday had rather cold conditions: my cyclometer recorded a low temperature of 35F on some of the valley roads. Once again, the waterfalls and streams along the course were flush with water from the recent heavy rain earlier in the week. The Blue Mountain 400k has always been one of the more challenging routes on the Eastern PA calender. The course changes this year were actually intended to make it a bit kinder and gentler. The segments along the Delaware River were extended and at least on paper, those rollers along Old 22 didn't seem so bad. But of course, you don't ride on paper, and in reality, the route seemed much tougher. But the riders clipping-in proved to be even tougher: All 22 starters made it back in good time for another 100% finish -- congratulations to all for that remarkable result on such a challenging course. Of note, Greg Keenan completed his first 400k -- this distance is a big milestone for randonneurs, and a stepping stone to tackling the longer brevets -- congratulations, and well done! Don Jagel writes: "...Thanks for another great PA 400k. The real star of the day was volunteer extraordinaire Len Z., who, starting with a restaurant quality breakfast buffet (and cleaning up after all of us), met us a Milford to sign everyone in, and then surprisingly met us all yet again at Church Hill Road with water and snacks. All of this was accomplished on his way over to Princeton to take care of the final control for the NJ 300k brevet. Talk about over the top...Thanks Len! I got my mechanicals out of the way early by first breaking my rear derailleur cable before getting to New Hope. Rick C help with the replacement by holding the light at all the right angles so I could find the little holes under the brake hood to feed the new cable into place, thus making for a quick repair. Then 2 miles past Milford I got a flat on the rear tire. That was the most mechanicals I have ever had on a single brevet. Doug H did mention that mechanicals happen in three's so I was afraid that the thought alone might jinx me into having another mechanical, but the rest of the day was mechanically uneventful. The first half of the ride was a nice warm up with the hills gradually increasing after the Water Gap. The hills in the second half of the route more than made up for the flatness of the first half. I think this was the most challenging 400k I have done. I caught up to Norm, Peter and Jan at Blondies and rode with them for most of the miles back to Quakertown. I did not get enough calories at the New Smithville control, so the last leg starting with the climb out of Macungie (Thanks for that route suggestion Rick! ), and Kings Highway really did me in leading to a strong bonk with only 2 miles back to the Hostel. I was truly overjoyed to get to the final downhill on Clymer Road, and once again see Pat at the finish (Thank You Pat. Looking forward to seeing you and Cecile at the 600k). This was a 400k I won't soon forget/remember....."
weekend. Although I do say "great" with some relief knowing that's it's behind me! ...I suspect that the finishing times will confirm my perception that this was one tough ride. All good, though. Always great to ride with you and such a wonderful group of randonneurs! ..."
Susan Rodetis writes: "...My cyclometer clocked 40 as the low temp; figure a 30mph descent or two, that lowered the wind chill to 28. No wonder I was cold and partly hypothermic by the end. And I was sooooooooo underdressed; quite the opposite of what I usually am. We all learn...."
Guy Harris writes: "...Interesting and surprisingly challenging course, thanks. Despite living in this area for over 20years I didn't know much about the Hex highway/old Rt. 22. I went through this section between 7:00 and 10:00 so had the benefit of daylight for most of it. Kings Hwy was "fun" and I had the benefit of darkness for that one! Blondies and the diner in Bowmanstown are nice stops to look forward to. Many thanks to Len, Norm, and Pat for helping out on this one..."
Jan Dembinski came all the way down from Vermont to ride with us, once again. Jan writes: "... Another wonderful 400! I’ll be telling lots of NE randos about the lovely, quiet roads in PA (so many of them were so, compared to NE roads). Great course. Of course the last 75 miles were mild torture, especially with Norman and Peter pushing the pace. I’ll be back in a year or two...."
Doug Haluza writes: "... double kudos to you Tom for both organizing and finishing a particularly grueling 400k. And big thanks to Len Z for earning double bonus points by supporting two brevets in the same day--it's always a nice surprise to see a familiar face on a long, lonely ride. ... I'm puzzled with how the route changes actually made the ride seem even harder. My 25h finish is a personal worst for a 400k, so it is definitely the hardest 400k, and probably also the hardest brevet I have ever done. It really hurt on the long leg back in the dark (at least as bad as the last 200k of a 600k). The only thing that kept me going was that pressing on to my bed at the hostel sucked less than sleeping in a ditch. It was great to have company (including you) in a big group at night, because it would have been really dark doing that solo in the dark. ...Thanks again for this really intense experience--makes you really feel alive...."
Larry Midura writes: "...Really enjoyed the 400K route! Liked your choice of new roads with a gentle start along the Delaware to the Gap then picking up the traditional Blue Mt. route...."
Dan Aaron writes: "... Thanks for running another stellar event. The route was scenic and challenging. Sign me up for the 600 on May 31. I am obligated to ride it since I've already written my limerick. ...."
Bill Olsen writes: "...Tom - Thanks for the great route on Saturday's 400K. The initial section down to New Hope and back up to the Milford Controle was beautiful, especially when seen through the early morning fog, and clear moonlit morning. It was nice to see the 100% completion rate, especially knowing the challenges the route presented, although having finished, I'm not sure how many of us would have been up for another 200K, as will be required in two weeks..."
Special thanks to both Cecilie and Patrick Gaffney for checking out the course with their volunteer preride -- this was their 3rd check-out ride in a row, along with Pat manning the finish at the hostel and cooking the post ride meal. For the 600k, you'll see Patrick and Cecilie taking the start on the day-of-the event. Thanks also to organizer Norman Smeal for helping with the start controle and sending us on our way. Thanks also to Doug Haluza for helping out at the start/finish. And as noted by Don, a big thanks to Len Zawodniak for supporting both the PA400k and NJ300k on the same day -- that must be a first-time feat, that I doubt anyone would even consider attempting. Len recounts: "... I had a great weekend. I got up early to make breakfast for my friends, then took a nap. Later I met my friends at a bakery for second breakfast. I rode my bike for a (short) distance in the PA hills, took another nap in the sun and read my book, while waiting to see my friends again!! How good is that?!..." The current cuesheet posted is from 2013, and some route tweaks are being contemplated -- let's hope the changes don't end up making the course so much harder like they did for the 400k! Controle 4 in Water Gap is listed as the Village Farmer and Bakery. If you want something more substantial, you can instead go next door to the Water Gap diner for a sit-down meal and to get your card stamped. The cuesheet has been updated to draft 14 (5/14) with changes and corrections from the volunteer preride. The pre-ride was completed this past Sunday by Pat and Cecilie Gaffney. Pat reports: "...Our ride got off to a bit of a rocky start. As we turned onto 313 I noticed that our cyclometer was not working properly and by Ridge Road it had stopped working all together. After about 10 minutes or so of fiddling, fumfering and cursing we got it working again (some water had gotten into the wireless transmitter). Now, we were on our way. The first segment was nice and I am sure that most riders will recognize many of the roads from the return on the 200K. We did notice that we hit Deep Run Road before the SS at Kellers Church (mi 9.4). Irish Meetinghouse merges with Deep Run about 1/4 mile before the intersection at Kellers Church. Crossing 611 (mi 11.3) is a TFL and there are a lot of pot holes and rough road on Carversville Rd. We actually hit one hard enough to screw-up our cyclometer up again for a few minutes. (It did work fine the rest of the day). Riders, particularly in a group, should use caution! Route 202 had a little bit of rough pavement as well, but nothing to drastic. The ride from New hope to Milford went quickly. We had to deal with some heavy fog that got us pretty wet, but other than that nothing out of the ordinary. I think that most riders will be traversing this section early enough that traffic won't be an issue. Milford to Water Gap was very pleasant as well. The sun had burned off all the fog and traffic was very light. There also seemed to be a nice trailing wind pushing us along 519. Crossing back into PA we noticed that Sandy Shore Dr (mi 73.9) is unmarked. There was also a bit of gravel on the shoulder of 611 in between Portland and Water Gap. Fun time ended as we headed out Cherry Valley Road on our way to New Ringgold. The road was fine but the winds picked up and the sun started to get hot. The cue indicated to follow the PA Bike V sign( at mi 92.1), but i believe bike route V makes the left onto Blakeslee Rd there not Cherry Valley, which is the TL. Riders should also be careful crossing Rt 115: it is busy with fast traffic. As we made the turn onto Little Gap Road the sun and the wind slapped us in the face. A stop at the diner in Bowmanstown helped, but the last 15 miles to Blondies were rough. The roads were fine, just hilly and hot. We left New Ringgold feeling better, but we had looked at the profile and were riding with less than eager anticipation for the spikes ahead. The construction at Rt 61(mi 151.1) is complete and crossing was easy. Hickory Lane didn't seem as troublesome as I remembered, but the views at the top were fantastic as usual. The right turn onto Martins Rd (mi 167.5) is unmarked and easy to miss. We both agreed that the climb up 645 was the steepest we ever road/walked up. It made Millbrook Road on the 300k seem like a mere bump in the road. Everyone should be careful on the decent, it is extremely steep (14% grade) and the TL is pretty sharp. Once we made the turn it was easy riding into the control. Frystown to New Smithville was easy. The road was in good shape with the exception of the shoulder for about the last three miles to the control, which was kind of rutty. It was nice to not have to worry about navigation too much as we were on the same road for 34 miles. mi 97.9 - Rt 115 - busy intersection. After entering Macungie on 100 and crossing the RR Tracks, I make the 2nd major right onto Chestnut Street ( at TFL - Buckeye Rd terminates left at this intersection). Chestnut St turns into Sweetwood Dr then climbs out of Macungie, where after the climb I make the first “real” left onto Macungie Mtn Road, then cross St Peters Road (becomes Furnace Hill Rd) and make 1st left onto Indian Creek Rd. At the intersection with Rte 100, you can turn left onto 100 then bear right onto Fountain Rd which connects with Kings Hwy...."
Rick's alternate routing through Macungie has been incorporated into Draft 14. As one of the more challenging routes on the Eastern PA schedule, participants in the past who have not been able to finish have opted to check into a hotel. With this year's revised course, there are hotels off-course in Pine Grove as noted on the cuesheet. It would be a good idea to pack a credit card for this eventuality. With the idea of making the course a bit "kinder and gentler", this year's edition follows the Delaware River for a longer stretch in the beginning segments. Note that the first controle stop in New Hope is an un-timed information controle. There is a 24-hr WaWa nearby, if you need anything, but most riders will probably want to make this a quick stop-and-go. The additional mileage along the Delaware River means that you'll be seeing the big climbs between Bowmanstown and Pine Grove a bit later in the day. As noted on the cuesheet, you should replenish your supplies at Bowmanstown before heading into this hilly terrain. After the controle stop in New Ringgold, you can replenish your supplies in Orwigsburg. Volunteer Norman Smeal will be checking you in at the start, cooking you oatmeal, and sending you on your way on Saturday morning. If you are staying at the hostel on Friday night, arrivals before 9PM should use the Woman's dorm. Arrivals between 9 and 10:30 PM should head to the Men's dorm. Later arrivals should use the Family dorm. I'll be attending my daughter's recital on Friday night, so you won't see me at the hostel. If you have any questions or issues, the house parents John and GerryAnne will be happy to help you. Volunteers Pat Gaffney and Norman Smeal will be greeting you at the finish. Please park your car in the gravel lot half way down the driveway on your right, between the road and the hostel. The few parking spots next to the house are reserved. Pat and Cecilie Gaffney are once again checking out the course this Sunday with a volunteer preride. Be sure to check back on the message board and website for any updates. And as usual, drop me a note by Thursday if you would like to join the roster. Please indicate any hostel reservations in your note. Chilly temperatures in the low 40F's and overcast skies at the start gave way to sunshine and high 60F's by the afternoon. The wind that help speed riders north along Rt 209 was most unhelpful for the return legs southbound. By late afternoon and through the evening, scattered showers caught nearly everyone at one point or another. The 4-6 inches of rain that had fallen earlier in the week left all the streams and water falls flush with water. Tthe 38-mile segment from Hainesville to Great Meadows was one of the big challenges of the day. But as hard as it was, Bill Olsen correctly observed that it could have been even harder, had we gone just another mile or so along Rt 519 for the climb up to Jenny Jump. If you feel bad about missing out on that opportunity, you'll get a second chance by signing up for the upcoming NJ300k. 27 of 29 starters finished the 300k, and all 5 of the 200k starters were finishers. Of note, Chris Enrico (riding the 300k) and Jon Erwin (riding the 200k) joined a select number of participants who completed their first Eastern PA brevet as a first finishers -- congratulations, and well done! Also of note, CJ Arayata and Greg Keenan completed their first 300k -- congratulations to them both for reaching this milestone. Nigel Greene writes: "...an 'I survived the 2014 PA 300K' T Shirt would not be out of place. That was a tough course that lived up to the PA Rando reputation for climbing. Who needs hill repeats. Just do one of these course every two weeks!...." ... and you can follow the links at the end of the report to his photos and video slide show. Ed Bernasky writes: "... Thank you for another great course. Yesterday's ride was a microcosm of life itself from the hour upon hour of ego boosting effortless cruising north from Blue Mountain where I felt like a teenager again to having Norm the freight train and his entourage blow by me just before true reality slammed me in the face with the abyss of Old Mine Shaft topped off with "Mill break your back Brook" after which my body and Garmin went into a funk, both of which were cleansed with a refreshing little sprinkle from the gods, which was another nice bonus because my frame needed cleaning. In the end, you make it. We got the full life's treatment on a lovely course, thank you..."
Chris Newman writes: "..Thanks for another great ride. The route was beautiful as always although this ride seamed a bit more challenging than usual. I took great comfort in knowing you too were climbing Old Mine and Millbrook!... And thanks to Patrick for manning the finish controle and additionally to Cecilie for the pre-ride and helpful pre-ride report..."
Guy Harris writes: "...Thanks for a great selection of roads. It occurred to me this morning that I am passed by more cars everyday on my 25mile commute than I was on the entire 300K. The new installment of "101 ways from Riegelsville to Quakertown" is a keeper. Thanks to Pat for volunteering at the finish..."
Bob Torres writes: "... this was one heck of a ride, very scenic but probably the toughest 300 I have finished. It sure tested my climbing legs but it was also a fun ride to boot. One thing for sure, I will never forget Millbrook Road! ...Thanks again for organizing a great route and Patrick and Cecilie for the pre-ride and Patrick for greeting us at the Hostel...."
Joe Fillip writes: "...Thanks to you and the volunteers for all of your hard work on Saturday's 300 Km. It was great to see so many of the "usual suspects," and we lucked out on the weather (for the most part). I have to confess, however, that I hope never to see Milbrook Road again (at least on a bike). It was a bracing reminder of the difference between American and European roads - only in America would they build the road straight up the mountain side! ..."
Special thanks to both Cecilie and Patrick Gaffney for checking out the course with their volunteer preride. Patrick also ran the finish controle, provided the postride meal, and rescued a rider out on course, Thanks also for Bill Olsen, who helped man the finish controle, and also to Gilbert Torres, for helping out with the Friday night setup at the hostel start. All these helping hands make these events possible -- thanks! Next up, is the 400k on May17th. Details will be posted shortly. "...Our ride went well yesterday, though I did make a wrong turn onto Hope from Shades of Death and added a good bit of extra climbing. The first few segments went pretty smoothly. There are some rough patches on Richlandtown Rd, but its not too bad. The group should be able to make it through. The Shell station is not open on Sundays, and we noticed that they do not open until 6:00. The real fast riders may get there before its open. Danielsville to Water Gap went well. There was nothing out of the ordinary and the roads were in good shape. We had a few notes regarding segment three from Water Gap to Flat's in Hainesville. There are signs that indicate that Community Drive (mile 79.6) is closed. We were able to get through without any issues, though the road was a little rough and there was a lot of debris. Riders should be cautious. There is also a lot of soft deep gravel on the shoulder of 209 that riders should be aware of. The first 15 miles of the fourth segment are very pleasant. Once you turn onto Old Mine Road all pleasantries go out the window. Old Mine is not in very good shape, lots of pot holes and gravel. Its not impassible, as we were able to get up it on the tandem, but climbing out of the saddle is difficult because of the gravel. Millbrook Road, all we can say is wow! That is quite a climb. Again, we were able to get up it, but it was a real grind. After Millbrook the rest of the ride was pretty uneventful, but very pleasant. There is a good amount of gravel on the shoulder of 173 on the way to the Citgo. Lehnenberg Road was in pretty rough shape at the beginning, but smoothed out as it went along. Riders coming through after dark should be mindful. Finally Haycock Run Rd had a lot of big gravel patched, again riders out past dark should be cautious. As Pat mentioned in his ride report, there are several stretches of rough pavement and gravel to watch out for. Another spot you need to take extra caution is 9 miles before the finish. As noted on the cuesheet, there is a wooden bridge crossing that has an uneven surface. The cuesheet instructs you to dismount and walk across this hazard. Please take this caution seriously, especially if you will be encountering this bridge after sunset. Another hazard you could encounter just might be another cyclist. We all know to ride steady and not make sudden movements while riding with a group of other cyclists. However, even the most experienced randonneur may have a lapse in judgement, and unexpectedly jam his brakes on if he inadvertently drops a water bottle or cuesheet. So please remember to always ride defensively, and to expect the unexpected! The hostel is now full. For those with hostel reservations: Females will be staying in the "Family Dorm". The first male arrivals should use the "Woman's Dorm". Later male arrivals will use the "Men's Dorm". When you arrive at the hostel, the first order of business is to get your bunk ready in order to minimize disturbing those trying to get some sleep. Since we have a full house, earplugs/eyeshades might be a good idea. If roughing it with the dorm sleeping arrangements is not for you, there are several hotels in Quakertown you can go to instead. Please remember to park your car in the big lot to your right, between the road and the hostel, and be sure to stay on the gravel areas. The few parking spots near the house are reserved. Breakfast items will be available 1 hour before the start, and as usual, there will be postride food available. Volunteers, Pat Gaffney and Bill Olsen will be meeting you at the finish. There are 2 showers in the upstairs bathroom, and I encourage you to rest in the dorm before getting in your car to drive home. As always, be sure to check the website and PA Message board for any last minute updates -- and remember to refresh you browser to flush any stale pages that may be cached. And most importantly, be sure to have a **safe ride**!